Earlier in 1999, ID Magazine (International Design) published an issue in which they handed out their design awards for the year. An honorable mention was given to this lamp, designed by Finnish designer Harri Koskinen. When I first saw it, I thought, "This is a pretty cool lamp." But, I thought no more of it, since it was unlikely that I would ever see one in person, and the magazine did not say where such a lamp could be purchased. Then, in October, I visited the Mint Museum of Craft + Design to see the Dale Chihuly: Installations show again. When I was done, I dropped into the gift shop to see what they had in stock, and voilà!, they had the Block Lamp on display. Seeing one in person was all the inspiration I needed to pick one up. This lamp is made up of two separate blocks of glass, into which have been carved the shape of a lightbulb. The lamp assembly itself sits inside the two blocks of glass, which have thin spacers in between to allow heat to escape. 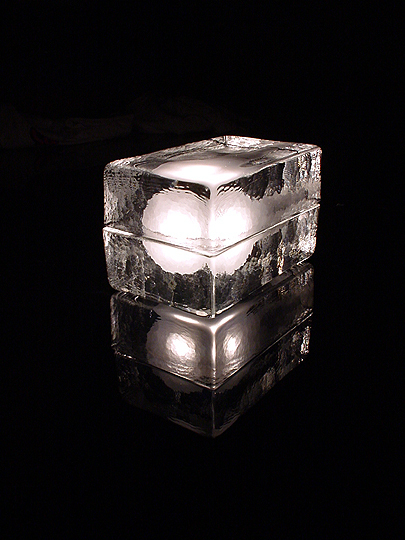 The light inside is actually smaller than the space it occupies; the way in which the glass is carved produces a trompe l'œil effect of a lightbulb encased in ice. This is seriously cool, I think. Plus, the glass is so strong that you can actually stand on this lamp. I plan to pick up some more of these in the near future.